Lots of people take public transportation. I do. In many cases it is cheaper, more convenient, and more energy efficient. Maybe you like the break from driving. I like to read a book. Sometimes I catch up on sleep. You may get to see people and get outside a little more. If you live or work in a city, it may be the only realistic option, even if you don’t like it. But do you get sick from riding the bus? How about the subway? Planes? Boats? Do all those crowds of people give you germs? Research shows that having ridden a bus recently puts you at greater risk of getting the common cold. But regular riders of the bus are more protected from the risk than occasional riders. It’s possible that the regular riders’ immune systems have developed more antibodies due to the repeated exposures to others. On a plane, the CDC and WHO used to advise that you were in danger of catching tuberculosis (TB) from another passenger if you sat within two rows of them for eight hours. The thresholds for the common cold and flu viruses are unknown. So that means a plane is just a hotbed of ickiness, right? Not so fast. The average plane has a ventilation system that changes the air 12 to 15 times an hour. The average office building only changes the air 12 times an hour. Overall, the known risk of catching an infectious disease on a plane is about the same as in an office building. The dry air of the air-conditioned environment in both settings can contribute to infection; dry nasal passages do not do as good a job of protecting you from infection as moist sinuses do. How about the surfaces in a plane? They don’t seem to be any more germy than the average work environment, either. Try to be healthy and well rested before getting on a flight. Stay hydrated on the flight. Wash your hands well after handling things. Are you considering a cruise instead? Cruises have all the same risks: Lots of people. Crowded spaces. Lots of surface areas touched by lots of people. Cruises also seem to have more risk of noroviruses, or what most people call “stomach flu.” The same precautions apply on a boat as they do on a plane. One more precaution: If you use a public bathroom and someone in there is vomiting or has diarrhea from norovirus, the air may be contaminated for a while. Get out and go to another bathroom. Then tell the ship’s staff of the occurrence. There isn’t a lot of research on subway and transit trains, but the same rules should apply. Wash your hands after you get off and before you touch your work area or home items. Don’t eat or touch your mouth until you’ve cleaned up. Delay flights until you are no longer infectious. The CDC has the authority to restrict you from air travel if you are sick from TB. If you have the flu, don’t fly or go to work until you are no longer infectious. Ask your doctor. If you have a common cold, consider not taking public transit until the acute symptoms are controllable. Almost all symptoms of the common cold (sneezing, runny nose, coughing) spread the virus around. If you must sneeze or cough, do it into the crook of your elbow, rather than your hands. 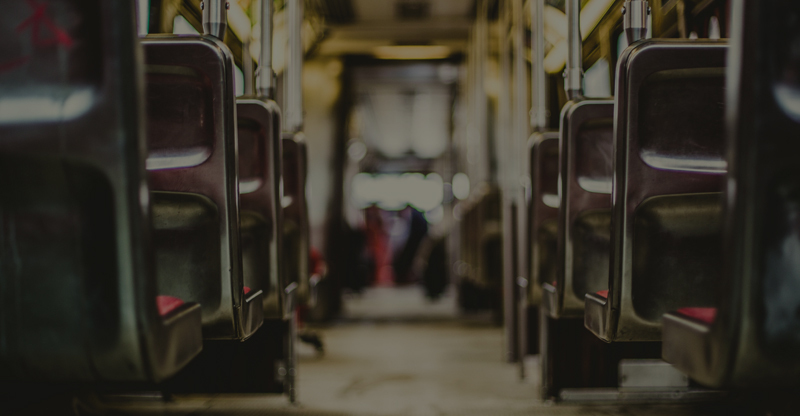 It seems that taking public transportation comes with infection risks that are very similar to those of our normal workday. Our normal workday has elevators, cafeterias, common bathrooms, conference rooms, etc. In the short run, taking the bus may make you more likely to get sick. In the long run, public transportation may strengthen your immune system overall. So keep washing your hands, and shy away from people who seem to be sick.